Are you interested in learning out the Navy's plans for sonar and bomb testing in the Northwest, and how that might impact whales and other marine organisms? As a citizen, do you have strong feelings regarding the topic? The Navy is holding a series of public hearings regarding sonar and bomb testing in our area, and one of these is tomorrow night (Tuesday March 4, 2014) in Newport, Oregon. There will be an open house information session from 5-8pm, along with a presentation given at 6:30pm. If you cannot make this event, check out the link above for a full list of dates. Visit this page for more information on the program and issues. I hopefully will have an updated blog post with more information and details regarding the hearings and naval programs soon. 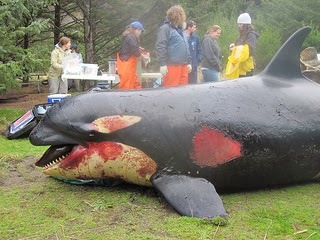 Orca that stranded near the Columbia River in 2013. Her injuries indicative of an explosion-caused mortality.